FREE APPRAISAL. 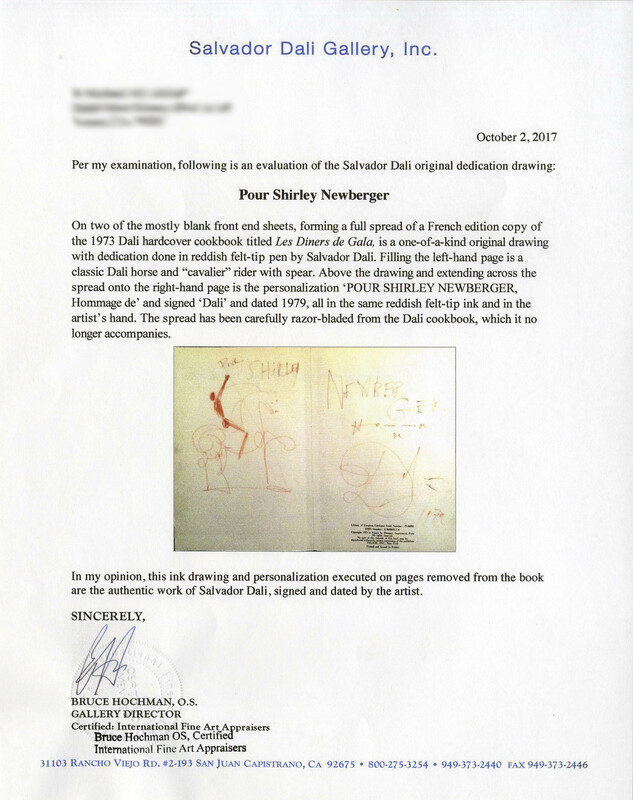 To buy, auction, sell or consign your Salvador Dali drawing with autograph that is for sale, please email Nate@NateDSanders.com or call the Nate D. Sanders Auction House (http://www.NateDSanders.com) office at (310) 440-2982. Salvador Dali is best-known for his 1931 surrealist painting The Persistence of Memory. His other more obscure credits include the iconic logo for confectionary company Chupa Chups and a cookbook “Les Diners de Gala” filled with surrealist artwork. Salvador Dali signed sketch of a cavalier rider with spear in hand upon his horse, possibly that of Don Quixote. The horse and rider motif is a familiar one in Dali’s oeuvre, including Dali’s illustrations for “Don Quixote and the Windmills” in 1945. 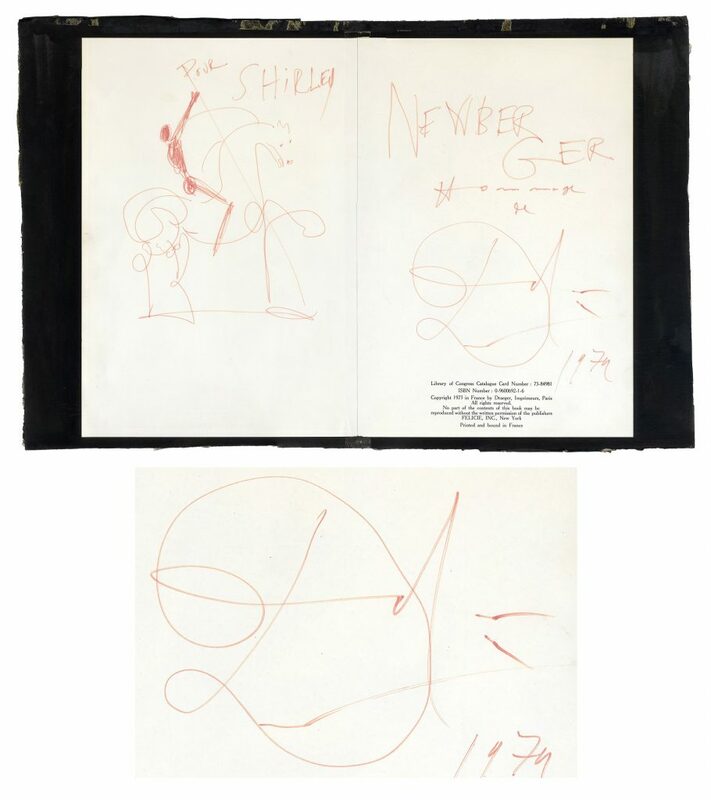 Sketch is rendered in red felt-tip, inscribed “Pour Shirley Newberger / Hommage de / Dali 1979”. Sketch and signature fill two pages of a French edition of Dali’s cookbook “Les Diners de Gala” measuring 16″ x 11.75″. A piece of clear tape connecting the two pages to board, otherwise near fine condition. With a COA from Bruce Hochman of the Salvador Dali Gallery. Sold for $2,405. Salvador Dali Signed Sketch of a Cavalier Rider Upon His Horse. Click to enlarge. COA for Salvador Dali Signed Sketch of a Cavalier Rider Upon His Horse. Click to enlarge. Very well preserved copy of Salvador Dali’s cookbook, “Les Diners de Gala”, complete with a signed sketch by the artist covering two full pages, measuring 16″ x 11.75″. 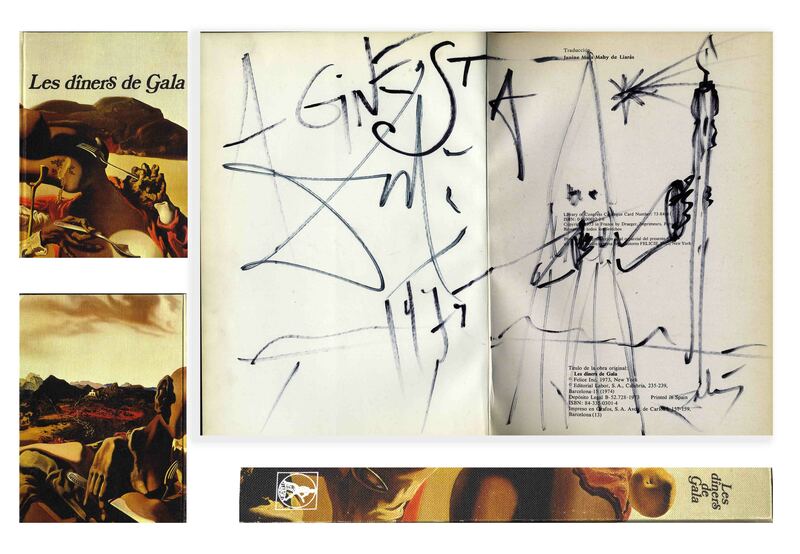 Upon the flyleaf and facing page, Dali draws a “Nazareno” holding a candle during Holy Week, and signs “Dali” below the inscription “A Ginesta”, done in black marker. Barcelona, Editorial Labor, S.A.: 1974. Cookbook is profusely illustrated with Dali artwork, mostly in color, and bound in buckram measuring 8.5″ x 11.75″. Near fine condition. Sold for $2,200. Salvador Dali Signed Sketch Within His Book. Click to enlarge. FREE APPRAISAL. 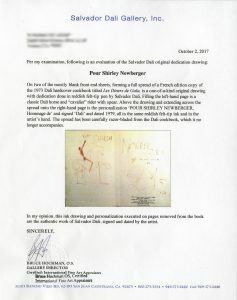 To buy, auction, sell or consign your Salvador Dali drawing that is for sale, please email Nate@NateDSanders.com or call the Nate D. Sanders Auction House (http://www.NateDSanders.com) office at (310) 440-2982. Salvador Dali drawing prices realized.